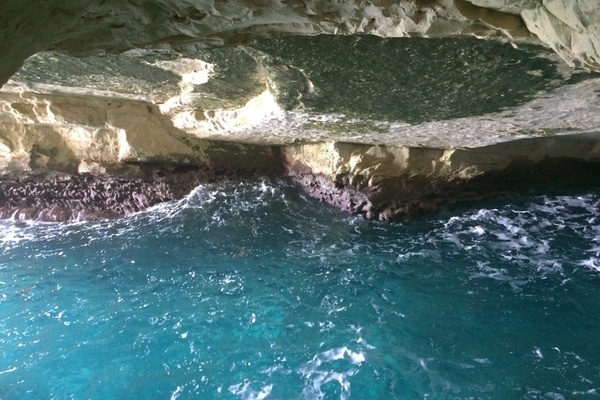 Hidden grottoes in Rosh Hanikra are an easy drive from Tel Aviv. All photos by Alyssa Weiss. Head two hours north of Tel Aviv for a terrific nature-inspired day trip outside the city. 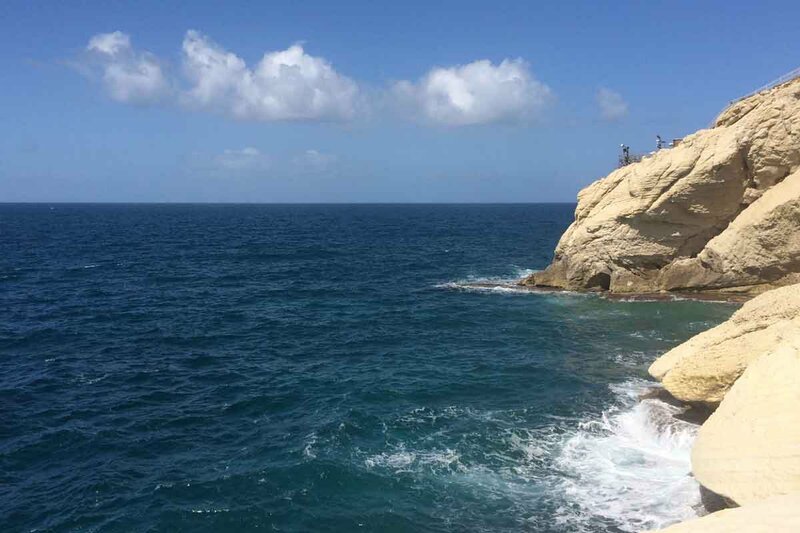 ISRAEL – If you're spending time in bustling Tel Aviv and need of a change of scenery, head two hours up the coast to the northernmost tip of Israel to Rosh Hanikra and the Bahá'í Temple in Akko. I took my family the last time I was there, and it was an excellent day trip. Rosh Hanikra, which literally translates as "the head of the grottoes," is a natural geological formation at the northwesternmost part of Israel on the border with Lebanon. Cavernous grottoes have formed over thousands of years where the Mediterranean Sea meets white chalk cliffs. The first thing I was struck by were the magnificent views of the coastline. We hopped on a cable car that took us 200 feet down to sea level. (If you're afraid of heights, cover your eyes. It actually looks much steeper from the top.) If you're lucky, you might spot a rock badger scurrying through the cliffs. The mountain bunnies are only found in rocky terrain across Africa and parts of the Middle East. They are elusive but very cute. The Meditteranean shoreline while in Rosh Hanikra. Once there, we meandered around the cliffs, making our way to the magnificent blue grottoes that lay below. Upon entering the cave, the temperature dropped, the floor became slippery, and a 600-feet-long network of caves revealed itself. One artery led to the right down a few steps to natural hole in the cave overlooking the first grotto. It was a spectacle of blues and purples, filled with a tumultuous watery floor drenched in sunlight flooding in. It is such a beautiful and unexpected sight. We spent a few hours walking the arteries of the cave, then got back onto the cable car for the ride back up to the glorious cliffs overlooking the sea. Truly magnificent. 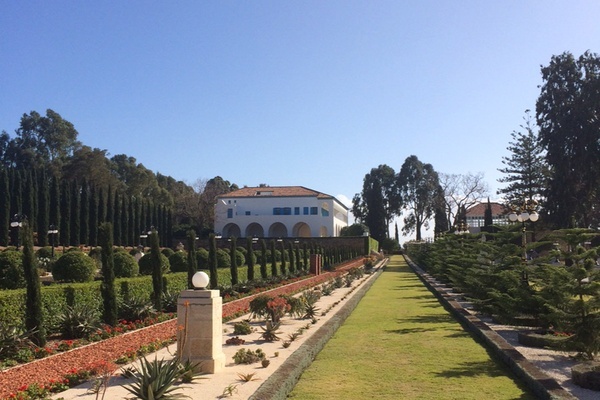 The picturesque temple at the Bahá'i Gardens in Akko. 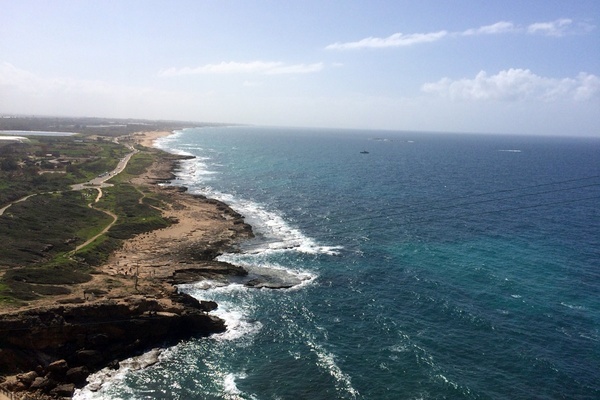 Forty minutes south of Rosh Hanikra is the port of Akko (also called "Acre"). It has been a marina and fishing port since the 15th century B.C.E., though its rich history stretches all the way back to the time of the ancient Egyptians. (When in the Mediterranean, after all…) Today, Akko, a small town of 47,000 that only fills five square miles, is a melting pot of religions — Christianity, Islam, Judaism, and Bahá'í. Our first stop was lunch. Seafood is, as can be expected, the cuisine to eat. We ate at El Babor on the port, overlooking the sea. In addition to the freshest, local catch in town, we ate an unbelievable spread of Middle Eastern salads and traditional flatbreads, among the best I have had. Ask what is fresh and order a whole fish. This is one of those best lunch ever spots. Cyrprus trees found in the gardens. 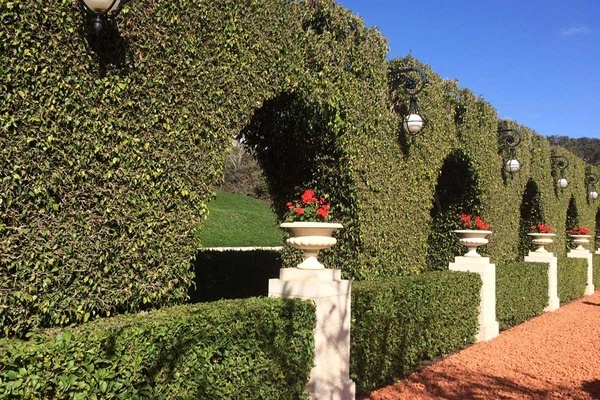 Our last stop was The Bahá'í Gardens. The Bahá'í faith, which emerged in Iran in the early 1840s, is based on the major monotheistic religions of the world and is primarily dedicated to creating a peaceful, more prosperous world through education. The complex, a 2008 addition to UNESCO's World Heritage Sites, consists of a formal, symmetrical circular garden with the temple at its center. 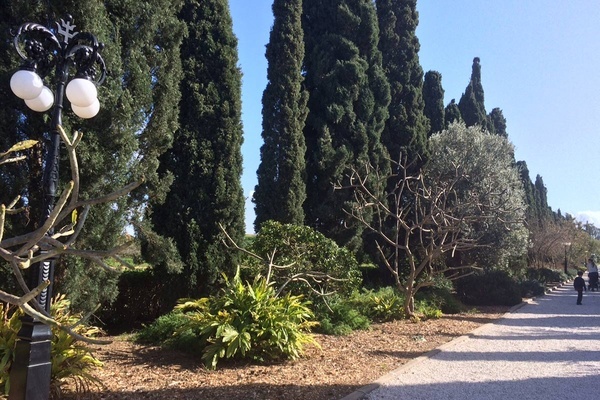 The garden includes magnificent cyprus, sycamore, fig, and olive trees. The best times to visit are Friday to Monday, from 9 a.m.-noon, when the temple is open to the public. Unfortunately, since our excursion to Rosh Hanikra was totally impromptu, the temple was closed when we visited. But the garden was so expansive that it was a treat in its own. Still, now we know for next time. And we will be going back. Alyssa is the founder and CEO of Travel Beauty. You can follow her on Twitter at @AlyssaBarrie. She travels for the adventures, the experiences, to learn new things, and to find the best beauty products from around the globe.